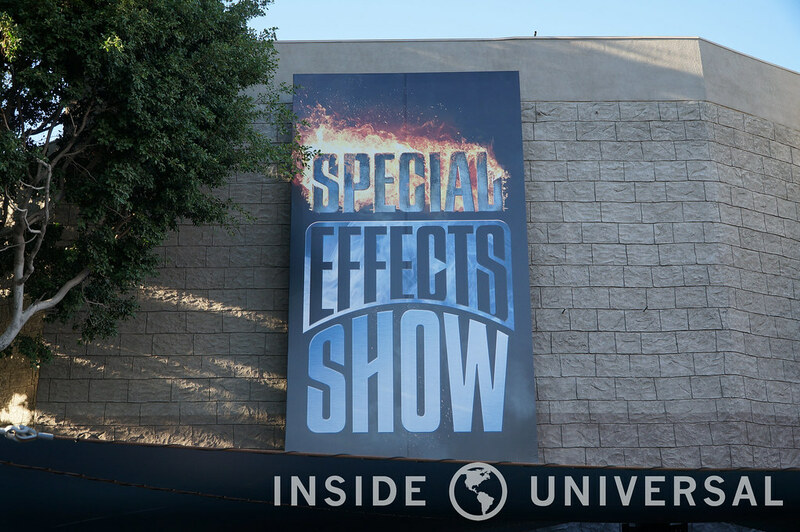 Take a special look at Universal’s new Special Effects Show! 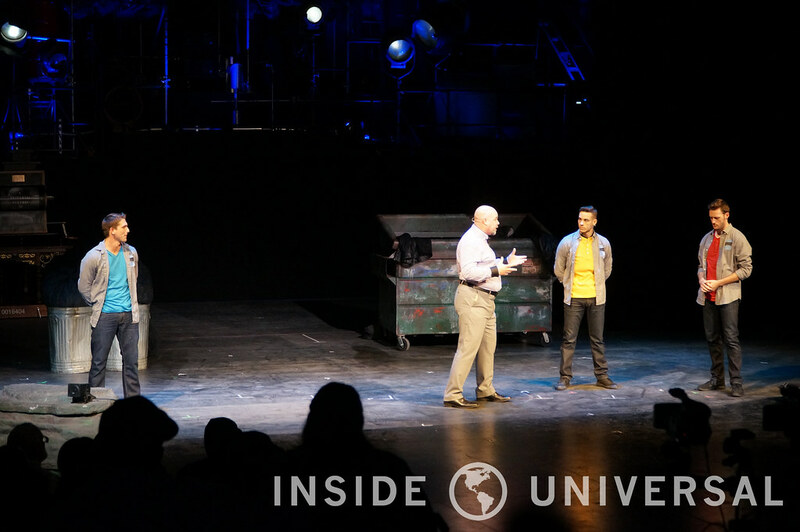 On December 18, 2015, Universal Studios Hollywood invited its Annual Passholders to a preview of their enhanced Special Effects Show, just two months after its closure in October 2015. A large crowd was in attendance that day to get a first look at the new show. 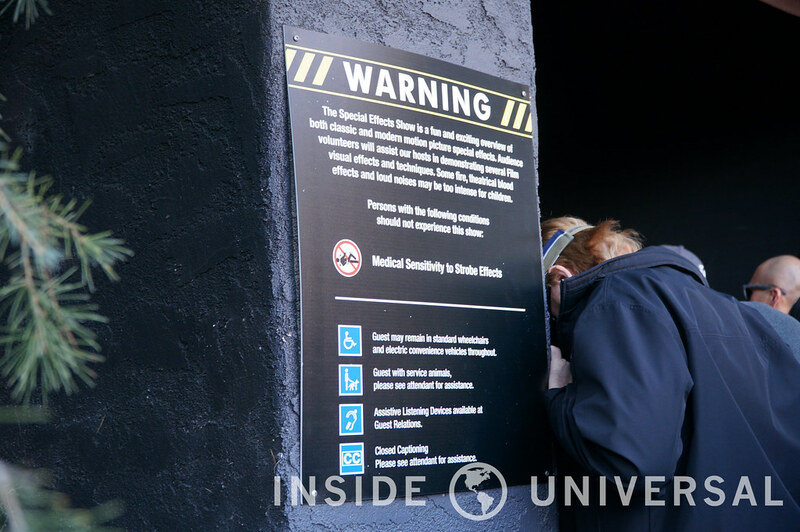 The “Warning” sign posted outside the entrance now warns guests of fire effects utilized during the show. This, along with the use of movie blood and loud noises may be too intense for children. 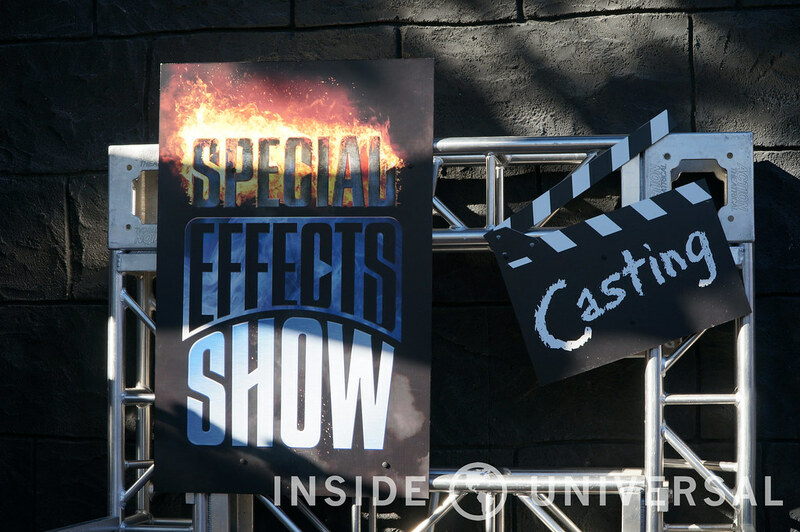 The new show also features an updated sign that advertises the use of fire effects. Unlike the previous sign, this sign has the word “special” covered in flames. To the unknowing guest, this updated sign gives a hint at what to expect inside. 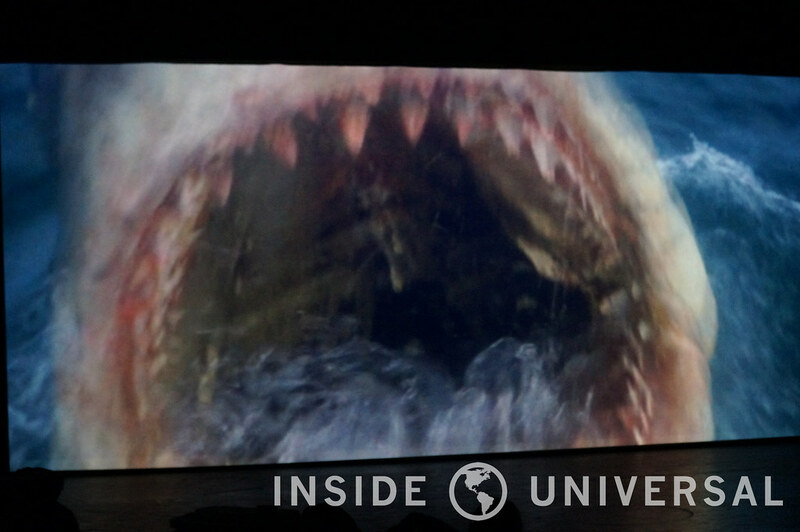 As guests enter the show building, they can watch an updated slideshow of Universal Studios facts and history. 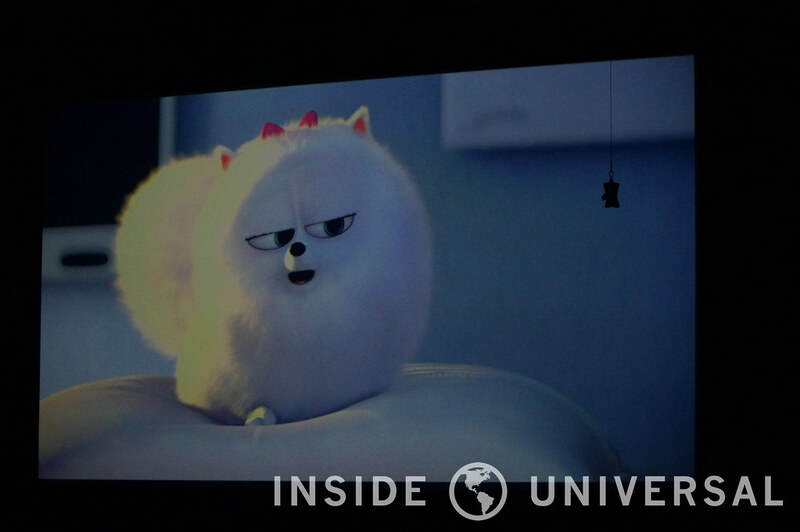 This particular slide is one of only a few flaws noticed during this preview event. 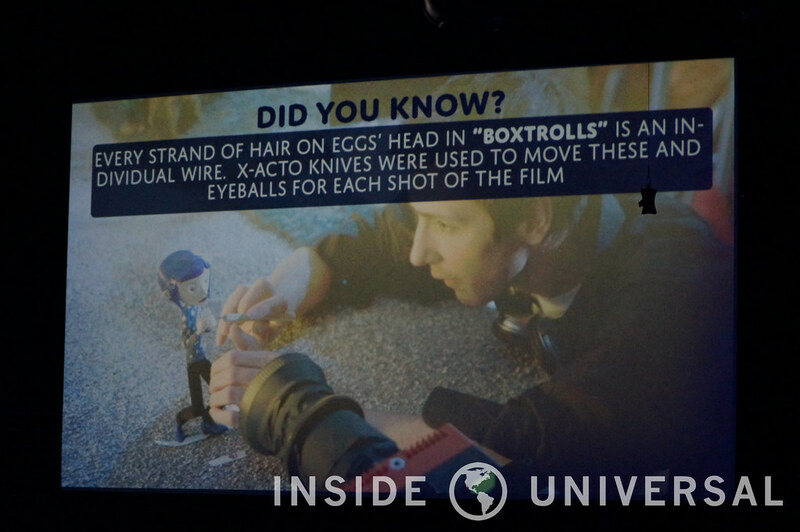 The blurb explains the process of creating stop motion characters like in Box Trolls (2014), however the picture shows a man working on a character from the movie Coraline (2009). 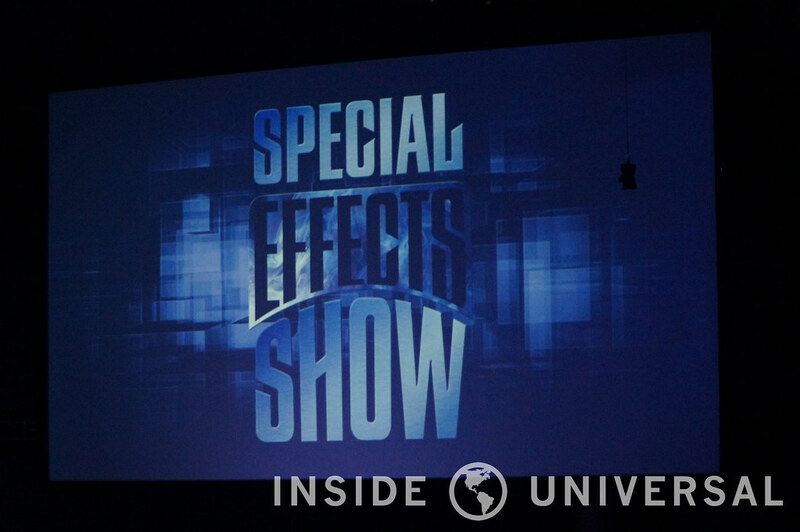 The projector was among the many elements brought back for the new Special Effects Show. 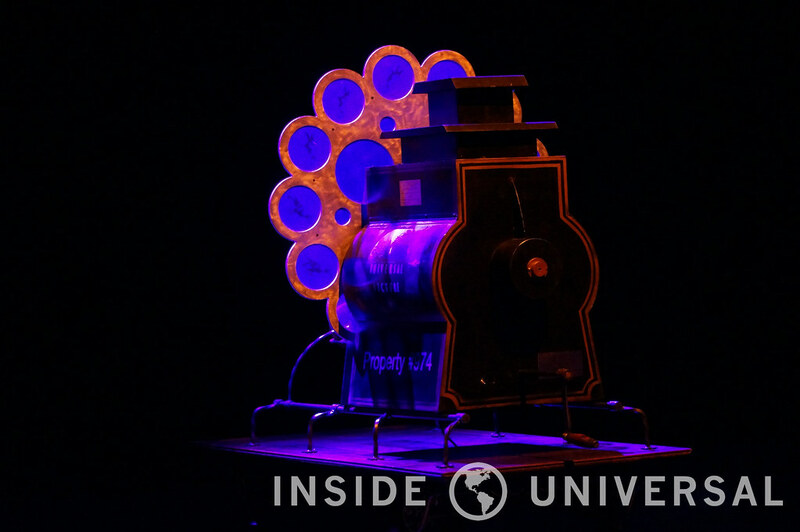 Like the previous show, the projector is used to start the show by demonstrating the magic of motion pictures. Unlike the sign outside the show building, this slide does not feature the added fire graphic. There are two projection screens, one on each side of the stage, where guests are directed to for show transitions and video clips. 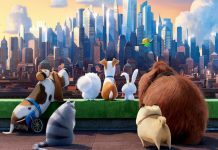 Along with the new updates to the Special Effects show, the audience was treated to a special preview of the new Illumination Entertainment film, The Secret Life of Pets, coming to theaters in July of this year. 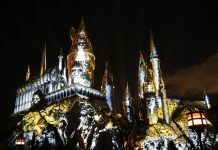 A host starts the show much like the previous show, exposing the audience to the art of special effects and the magic it brings to motion pictures. 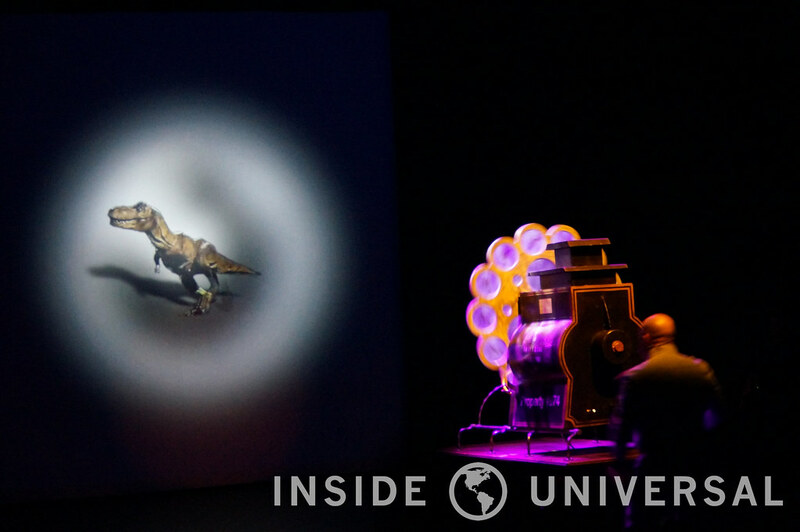 Just like the previous show, the projector shows the image of a T-Rex running. As the host explains, this motion is created by a series of pictures as they are projected onto the screen. 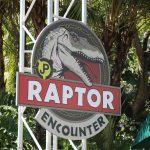 The show officially begins with a montage of shots and clips from some of Universal Studio’s most famous movies. 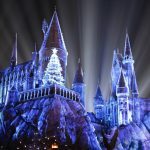 With a hundred years of movie making under its belt, Universal has created a number of iconic scenes and movies that resonate with today’s audiences. Like its predecessor, the show features two separate hosts. However, they are fitted with brand new jokes! Gone are the “classic” bits, including our friend, Jerry. 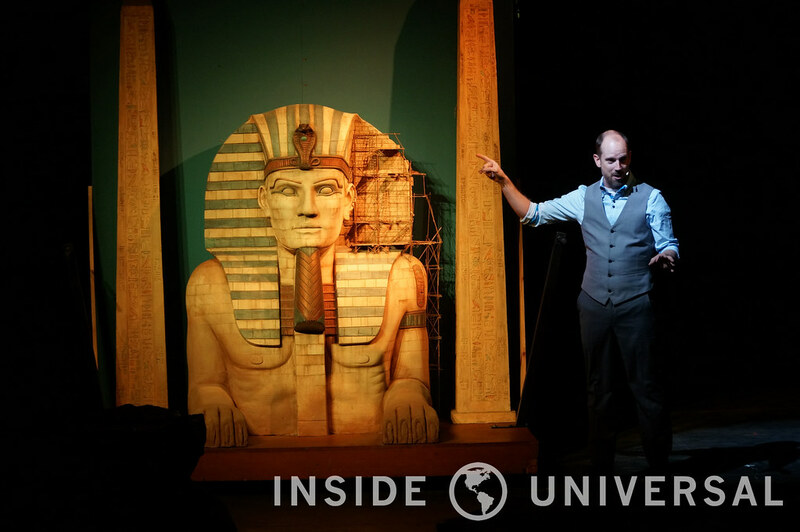 One of the many familiar elements brought back for the enhanced Special Effects Show includes the Sphinx miniature set. These types of sets offer directors a practical approach to creating settings that appear larger than life when brought to the big screen. It is at this point in the show that the audience is introduced to the most exciting and anticipated element, the stunt team. 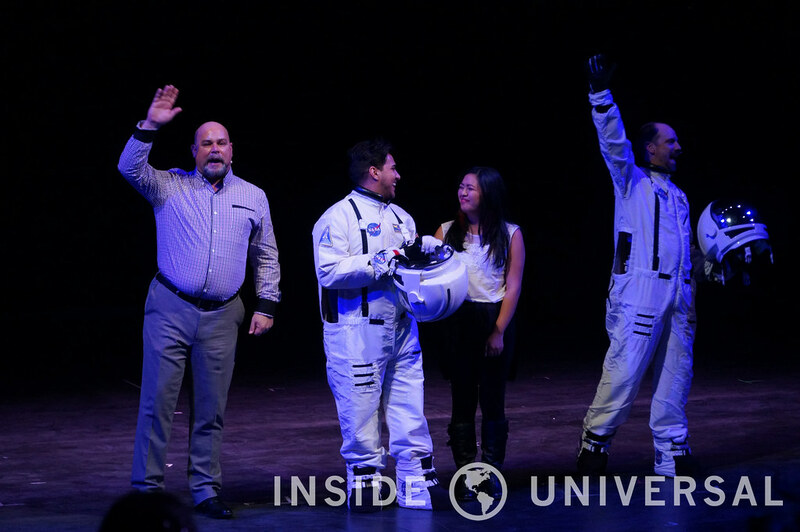 Propelling from the ceiling, the team makes a grand entrance into the new and improved Special Effects Show. 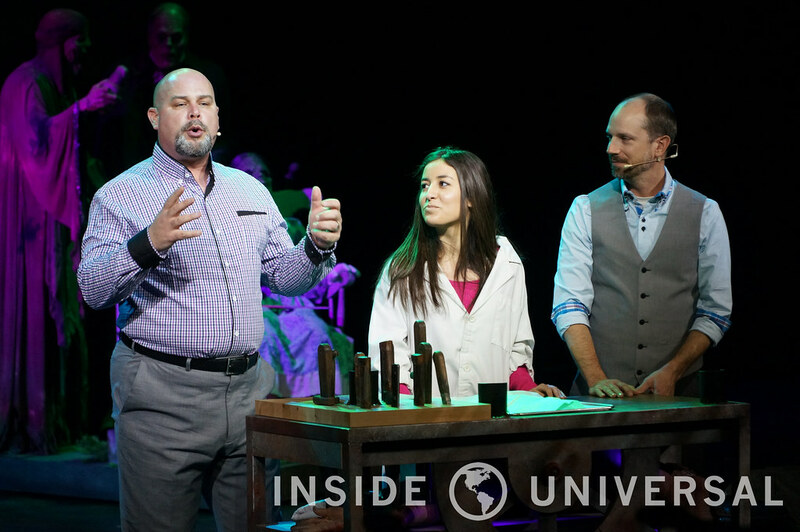 As the team prepares for their first demonstration, the hosts provide an explanation of their purpose in the movie industry. 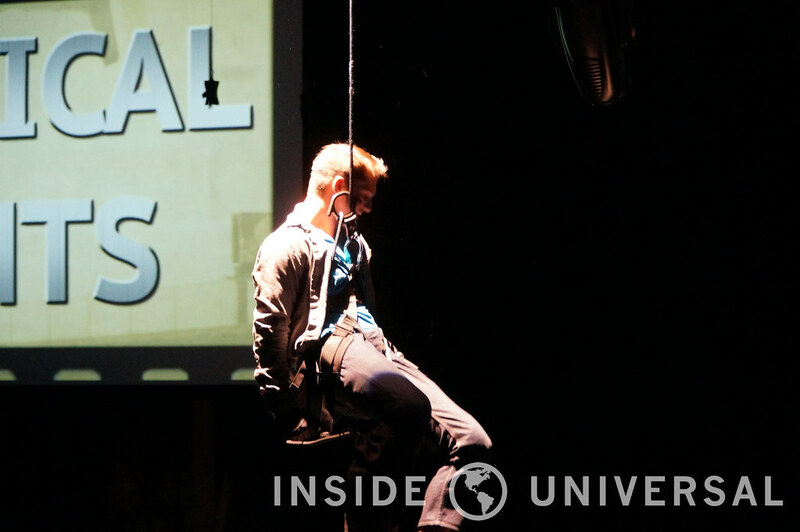 The audience is also exposed to a bit of the movie magic that goes into these death defying stunts. The first example of stunt work in action that the audience gets to witness is a carefully choreographed fight scene. 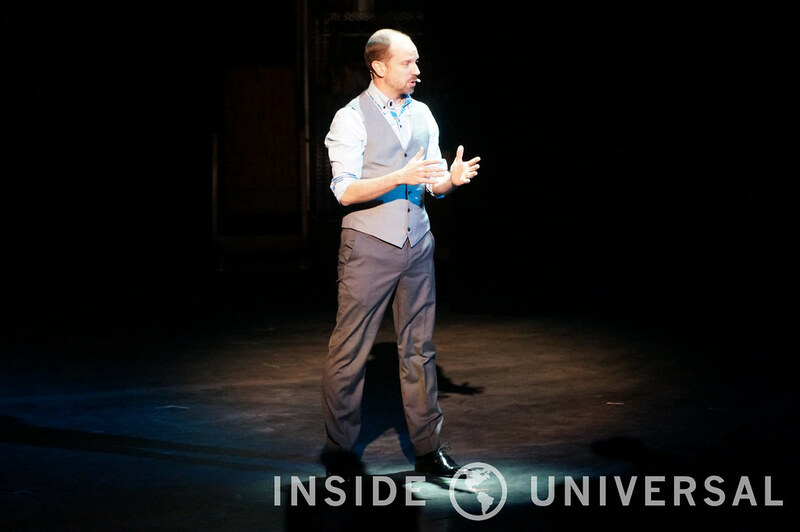 Here, the host sets the scene as he prepares the audience for what they are about to see from the stunt team. As the final preparations for this demonstration are being made, the stunt team starts to get into character for their upcoming scene. In this demonstration, the stunt actor finds himself in a bit of a tough situation. Placed in a fight where he is three against one, our actor has to fight his way to safety. This fight includes series of seemingly painful kicks and punches, executed with precision by the new Special Effects Show stunt team. After defeating his aggressors, our actor stands alone, victorious, and unharmed. This is solely due to the carefully choreographed fight scene that allows these actors to act out a convincing fight scene without any actual injury. 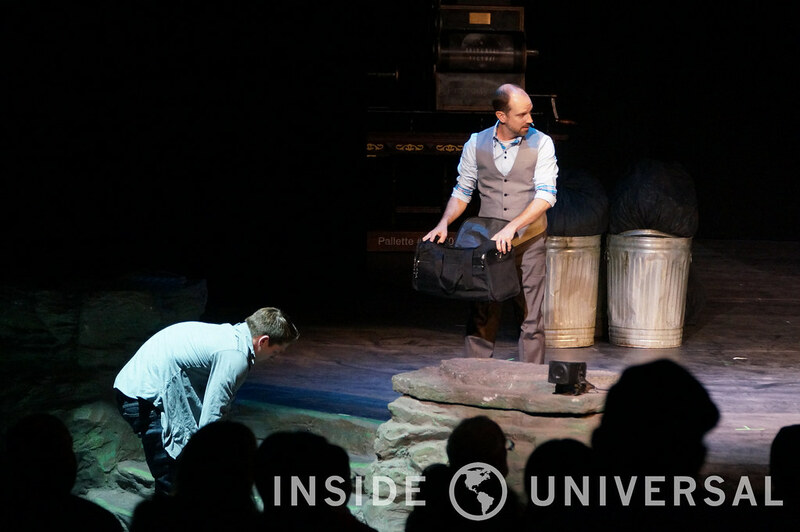 While the foley set was not utilized in the previous edition of the Special Effects Show, it has been seen before in previous versions of the Special Effects Show. This is also the first segment to include audience participation. 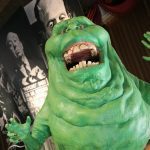 The new show no longer includes the green screen demonstration. Instead, it uses a family to create the foley sound effects for a scene from the 2013 movie, Identity Thief, starring Melissa McCarthy and Jason Bateman. The second audience participation segment involves the use of movie blood. 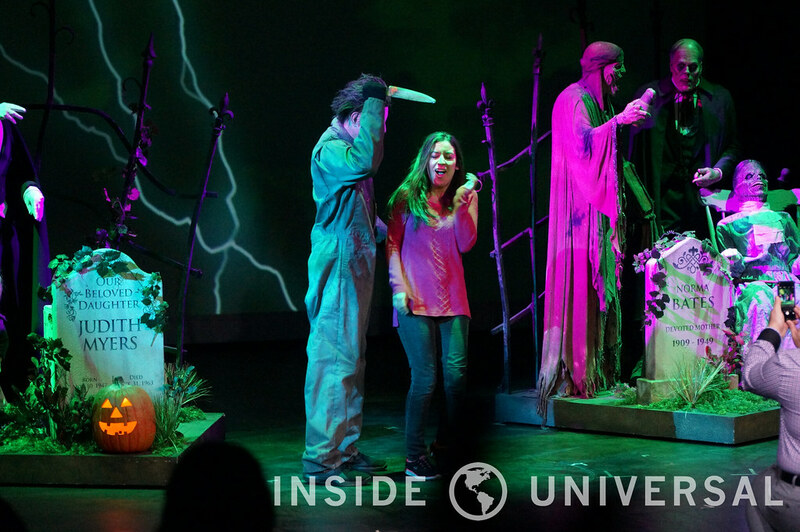 Utilizing the same trick from the previous show, the hosts appear to be cutting the girl’s arm off as she screams in terror, only to be shown the trick knife. 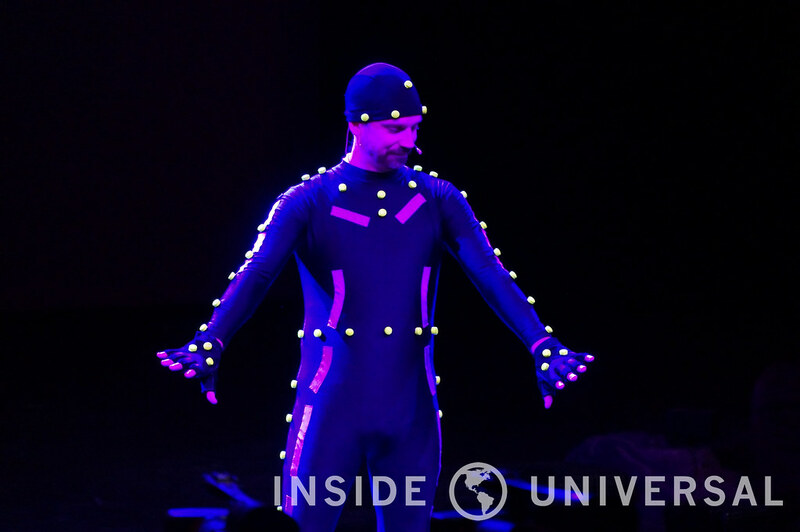 The ever popular motion capture suit has made a comeback in the new edition of the Special Effects Show. However, since we no longer have Jerry to do the “dirty work,” one of our hosts now has the opportunity to wear the coveted ensemble. 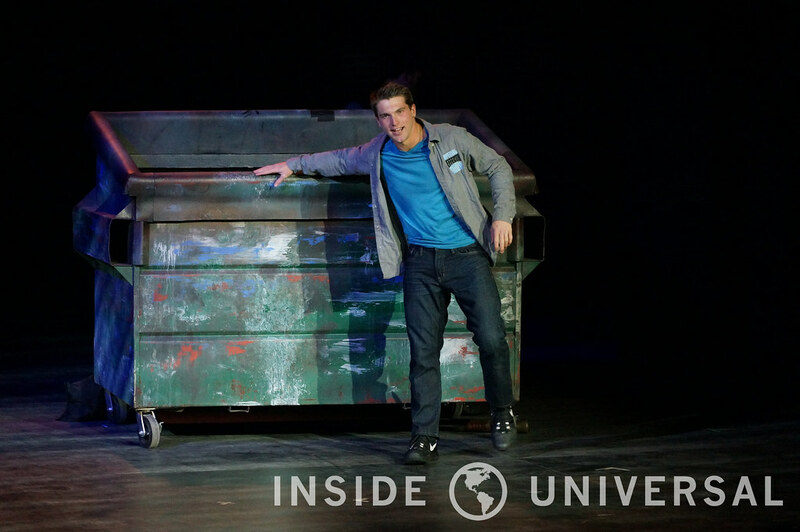 Just as we lost our friend Jerry in this new rendition of the Special Effects Show, we also lost our big, ugly ogre. 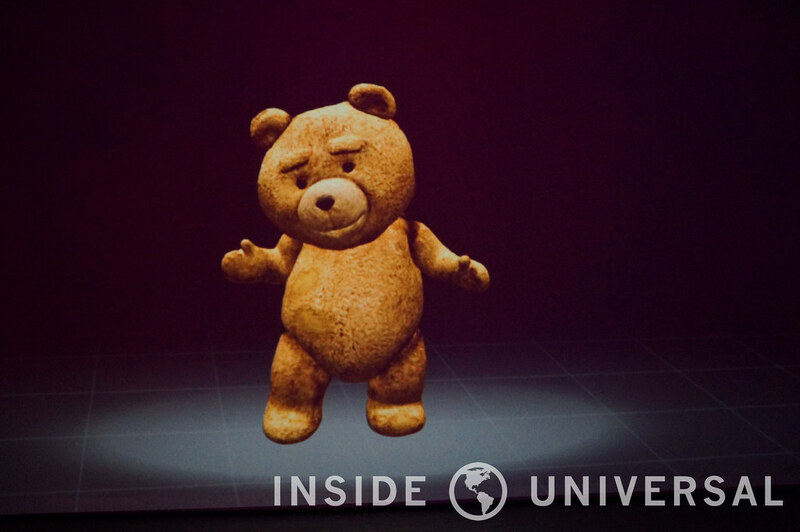 Instead, the motion capture simulation is demonstrated by America’s favorite teddy bear, Ted. 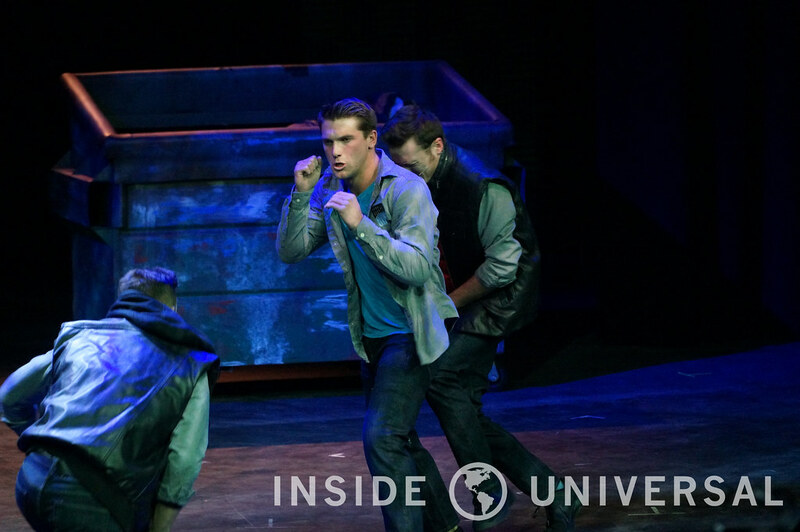 However, it appears he stole his dance moves from the ogre. 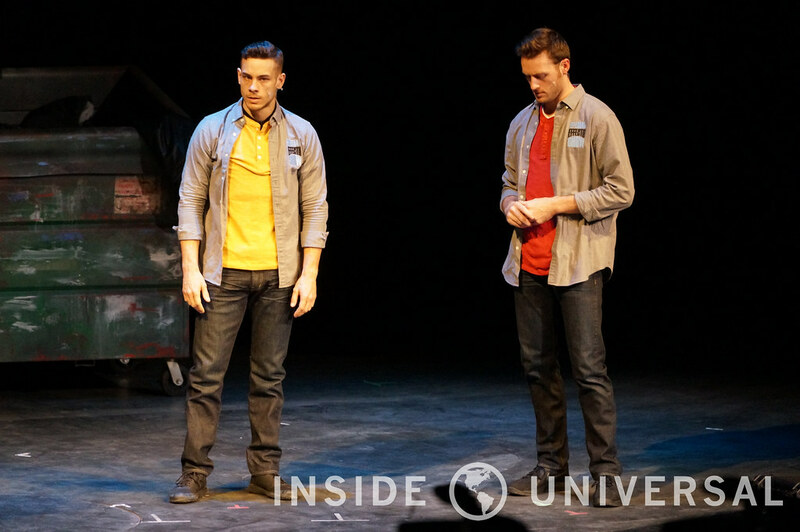 After a thrilling demonstration of MOCAP, the stunt team returns to perform another incredible demonstration. This time, the stunt team prepares to demonstrate how an actor can literally be set on fire without injury to himself or others. 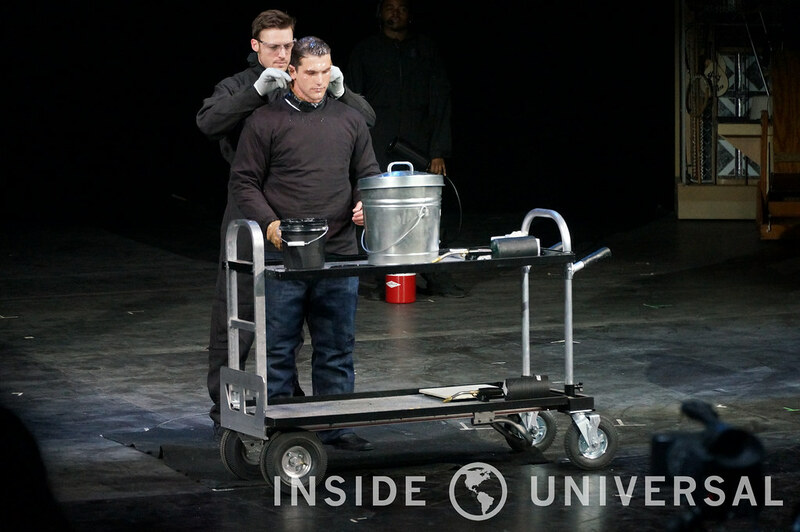 This stunt requires careful preparation, including the application of a special gel and several layers of clothing to protect the actor from burns. This is not something to be attempted at home. 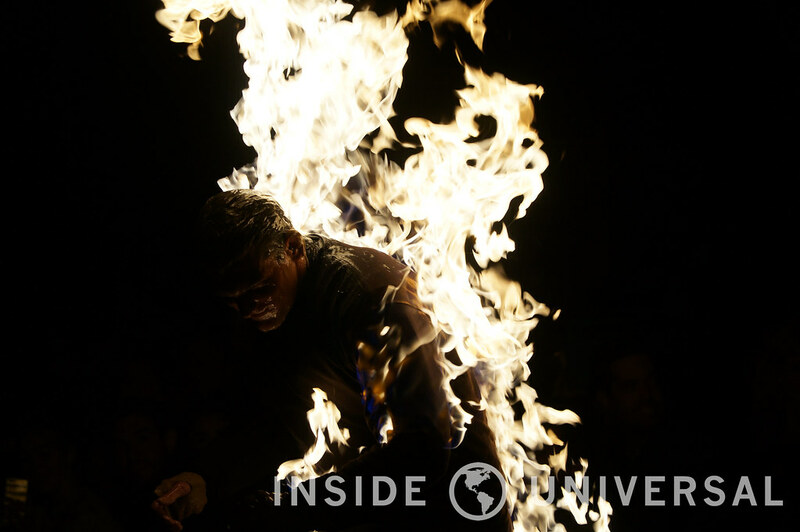 As the actor walks about the stage while on fire, the rest of the stunt team is gathered around prepared to intervene if necessary. Once the actor has had enough, he lies face down on a blanket while his team puts out the fire with fire extinguishers. They continue to be on high alert until the actor gives a thumbs up indicating he is ok. Again, this is not something to be attempted at home. 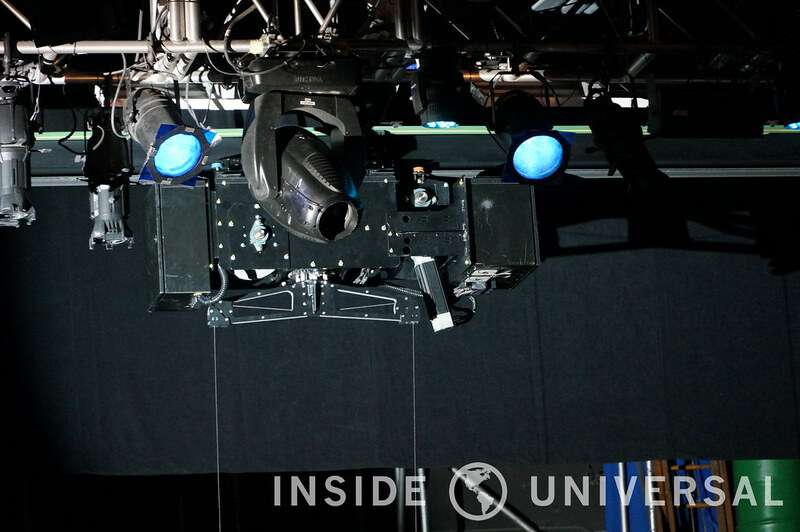 For those of you curious about the technological changes to the show, you may notice familiar lighting rigs. These are the same Fisher rigs that were utilized in the previous show. However, the final astronaut scene got a bit of a technological upgrade. 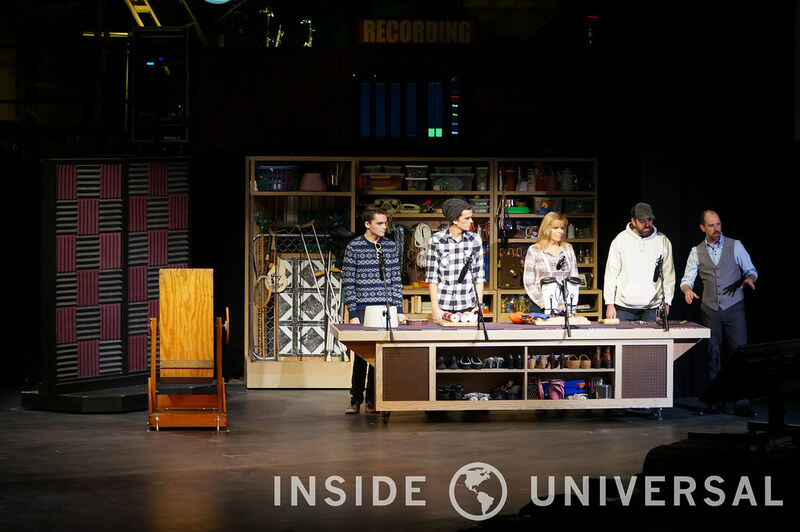 The show no longer utilizes the control panel stand with the lever and buttons. 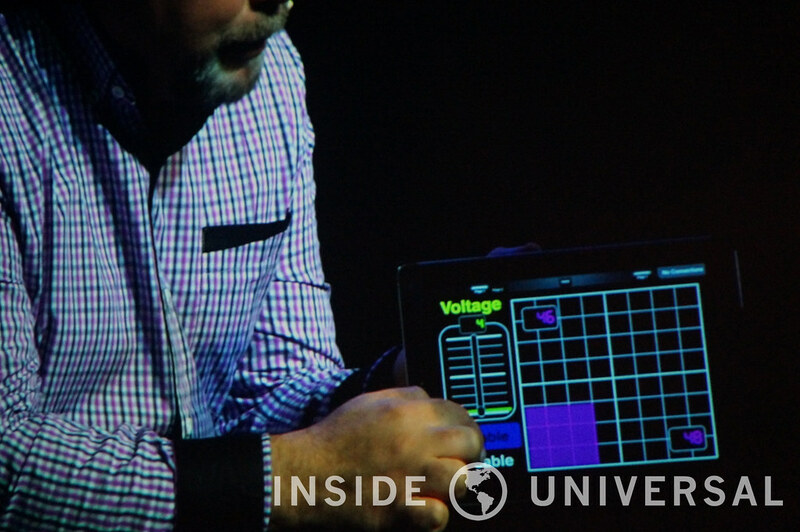 Instead, they now have an iPad app that can control the astronauts movements while on stage! Unfortunately, this change in technology didn’t do much to help the outcome of the segment. 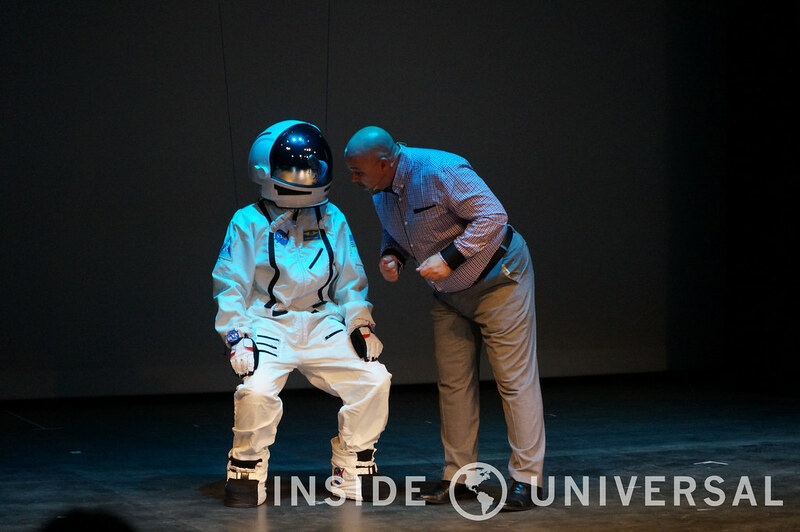 The poor soul in the space suit still gets flown about the stage with no control despite encouragement from our friendly host. Like the previous show, nothing in Hollywood is ever as it seems. It was revealed that the man in the space suit was not the audience member’s boyfriend, but it was, in fact, the second host. Despite all of this, however, the couple was all smiles as they helped to close out the new and improved Special Effects Show. 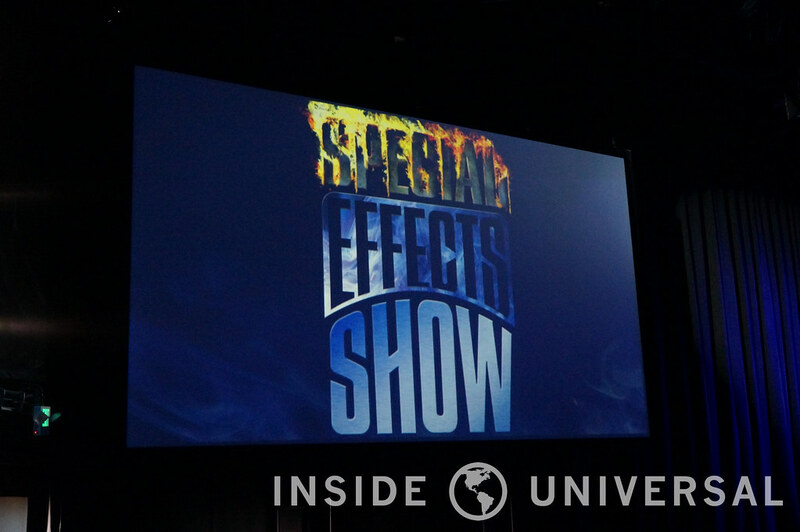 The newly enhanced Special Effects Show is now open for all to see! 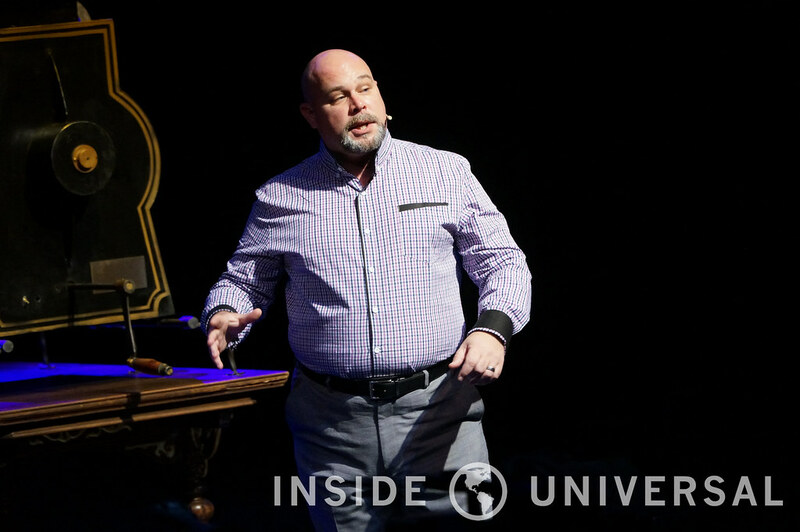 We hope you enjoyed this preview of the new show. Be sure to check it out for yourselves and let us know your thoughts in the comments down below. 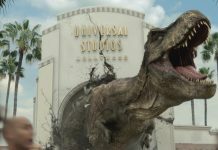 As always, thanks for making Inside Universal your number one source for all things Universal Studios Hollywood. 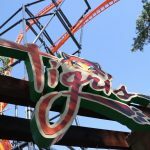 Stay tuned for future updates from the park!